If you are starting a bouncer rental company, there are a few initial investments you will need to make. The most important investment you will make is in the equipment. There are tons of wholesale bouncers for sale in LA. The trick is doing your research and understanding which companies are reliable and professional. The founders of Ultimate Jumpers, Inc. have been in the inflatable manufacturing business for almost 10 years. You can understand a lot about a company that manufactures inflatable units by looking at their warranty policy. Ultimate Jumpers, Inc. uses top quality, ASTM material for all of our inflatable products, which is 18.5 oz. PVC Vinyl. Many companies use regular threads, which can result in threads get rotten from sprinklers and/or rain. Ultimate Jumpers, Inc., uses polyester threads not only for water slides but for all of their products. In addition, seams play an essential role in quality and durability. That’s why they use double, triple and quadruple seams on the stress points making them very resistant to tears. Why do we mention all of this information? Because as a manufacturer of high quality, durable products, Ultimate Jumpers, Inc. is confident in their equipment. As a matter of fact, all of their dry units carry a three year warranty, and all of their wet units carry a one year warranty. In addition to that, they are so confident that the units are made the way they are supposed to be made that they have a simple rule. If you buy the inflatable, put it up, and are NOT happy with it, you have three days to pack it up and ship it back for a full refund. How’s that for confident? Ultimate Jumpers, Inc. offers impeccable customer service. Customers can browse the website and then immediately chat online with their friendly staff using the live chat option. 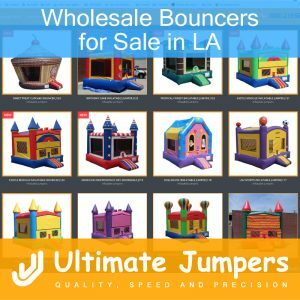 In fact, customers can visit the Ultimate Jumpers, Inc. facility in Baldwin Park to see the wholesale bouncers for sale in LA in person. As professional manufacturers of inflatable products, Ultimate Jumpers, Inc. strives to make safe, high quality bouncers.